The mapping here is done at the Census Tract level, of which there are about 2,100. These areas have an average population of about 4,000 though there is some considerable variation between areas in that several tracts contain more than 10,000. 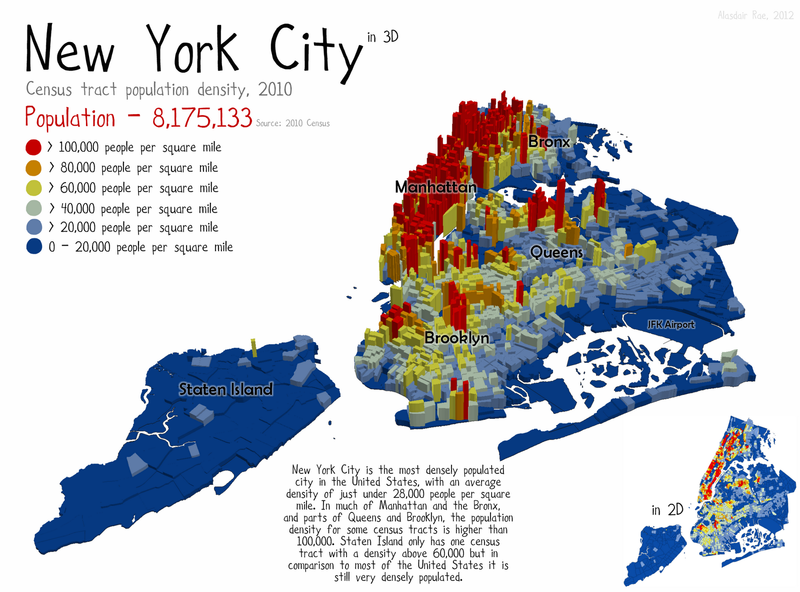 The spatial patterns above are fairly obvious and, as expected, Manhattan dominates once again. However, the individual Census Tract with the highest population density is actually in Corona, Queens with a figure of 216,000 persons per square mile*. * N.B. It's important to point out here that these areas are much less than a square mile, but I'm using square miles since it is a conventional measure of population density in urban areas). At the moment I'm doing some work related to housing market search behaviour and I have a very interesting dataset for it. 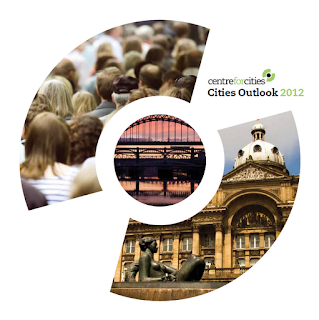 I thought it would be nice to compare housing market search patterns to where areas of green belt land in England are. This is where I ran into problems. Everyone knows that there is green belt land in England, but knowing precisely where it is and how to get this in digital format is more difficult. It seems that, for whatever reason, Landmark Information Group have the rights to the data, as you can also see from this BBC map. The problem is, I was quoted a price of £35,000 + VAT for the full dataset. I've nothing against Landmark but I couldn't figure out why it would be so costly or why it is not open data. To cut a long story short, I got the data directly from the Department for Communities and Local Government but the licence means I can't really do much with it publicly, so I've made a small map below showing what it looks like. The problem with this is that if a normal person* just wants to check which areas of the country are green belt and which aren't (and given current proposals to reform the planning system in England, this is quite important! ), it cannot be done easily, if at all. What I'd really like to do is take the green belt shape file and put it on top of a Google map and then let the world see it. But it's not my data, it's not open data, so I can't. This seems like a pity and not just because I'm addicted to mapping things. It seems like a pity because this information should, I feel, be in the public domain in an accessible format. *Clearly, I'm not a normal person or I would be doing something else at this time of day/week. My last post on London's Daytime Population is getting a lot of page views, which is nice, so I thought I'd do something else on the same topic. Although I do try to make nice images with data, there are some very important planning-related issues here. The first is just to do with the importance of knowing how many people live in an area. In New York City, the city challenged the 2010 results because it could have led to less federal aid, and in the UK in 2011 the city of Cardiff claims there was an undercount which could have led to them missing out on £85 million of funding since 2001. In relation to daytime population, this is also very important, but more difficult to calculate, as Robert C. Schmitt discussed in 1956. So, I looked at the 3,111 counties of the lower 48 states in the US and mapped them by daytime population density, as you can see below. Why does it matter that we know what the daytime population of a place is? Well, there are many reasons including planning for public transit, traffic flow, infrastructure needs, utilities and even for developing evacuation procedures (Schmitt was writing in 1956 but perhaps this last point is still relevant today). 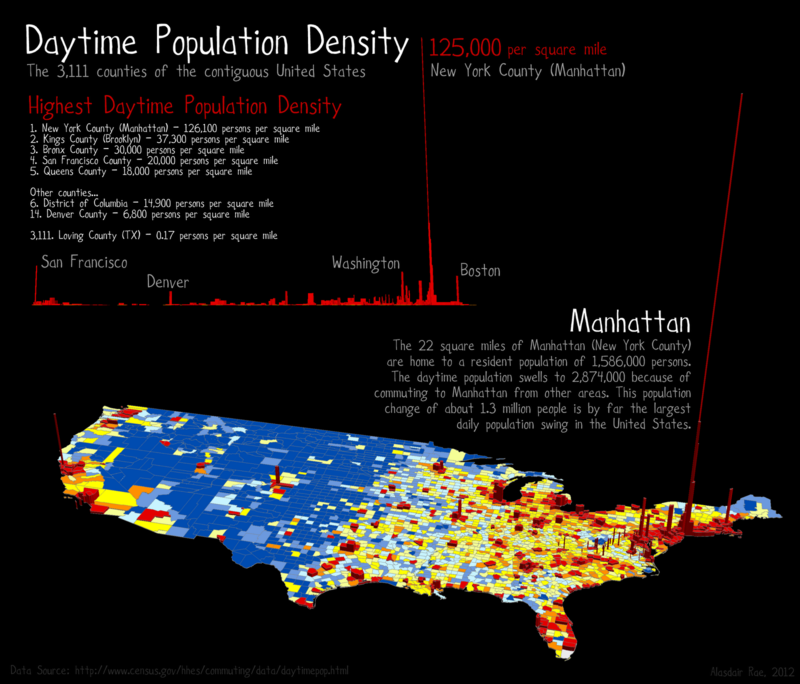 In the United States, the county with the highest daytime population density is New York County (aka Manhattan). It is far and away the leader in this category, with 126,100 persons per square mile. That doesn't quite match the daytime population density of the City of London but bear in mind that Manhattan covers 22 square miles! Manhattan's daytime population is also about 1.3 million more than its total resident population, which in 2010 was about 1.6 million.